We are now in the midst of winter, which makes it prime hot tub season! Before you slip into a relaxing soak, however, it is important to make sure your hot tub’s chemicals are properly balanced. Why does this balance matter? Today, we are going through the main reasons. Why is it important to keep my hot tub’s chemicals balanced? If your chemicals are not properly balanced, the water may damage the hot tub or equipment. This can lead to costly repairs – or even having to replace your hot tub equipment, or the hot tub itself. If your hot tub’s chemicals are not properly balanced, your water can turn cloudy. That can diminish your enjoyment of your hot tub. It also can be off-putting for guests. If your water is not properly treated, it can lead to infections, rashes or even chemical burns. Avoid all these issues by keeping your hot tub’s chemicals properly balanced. How do I keep my hot tub’s chemicals balanced? You cannot keep your hot tub’s chemicals balanced if you do not know what their levels are. Therefore, it is vital to regularly check the chemical levels in your hot tub’s water. Create a schedule to help you stay consistent. With larger pools, regular shock treatments are recommended. With a hot tub, however, it is generally easier to just change the water. This will prevent the growth of bacteria and algae, as well as ensure water clarity. 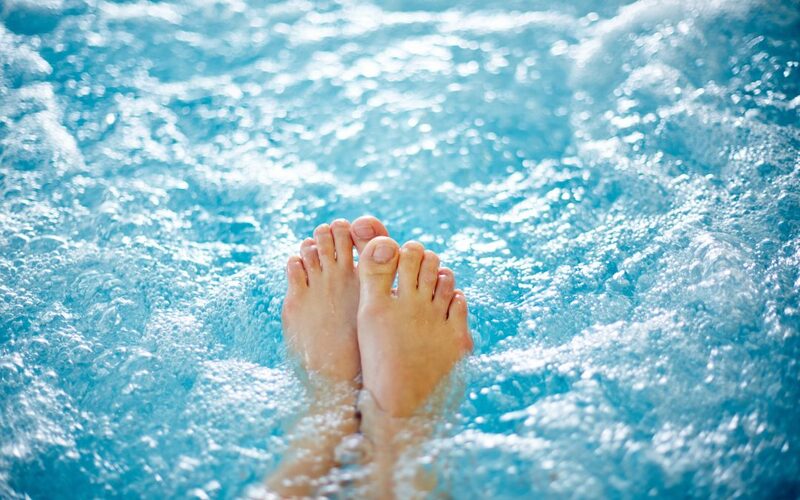 If your hot tub water becomes stagnant – even in the lines – bacteria can start to grow. Avoid this by keeping your water running 24 hours a day. It is important to scrub your hot tub down from time to time. The best way to do this is to do a thorough clean while the hot tub is drained. Just watch what you wash the hot tub down with as chemicals in cleaning products may get into the water when you refill the hot tub. Even in the winter, you need to keep up your maintenance regime. This will allow you to safely enjoy your hot tub year round. Beyond your hot tub’s chemicals, there is a range of other maintenance concerns to consider. Use these tips to help you keep your hot tub in the best possible condition.